Curse if you like, but it is another damnably perfect morning in Provence. Despite being on the threshold of autumn, the pale sun feels warm and good as it soars above the Luberon forest in a pellucid sky, silvering the leaves on the olive trees and glinting on the pale blue shutters and limestone buildings in the pretty village of Lourmarin. 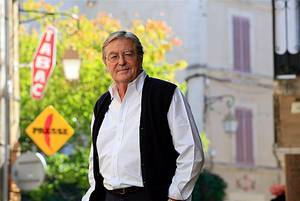 Sitting at a table outside Café Gaby, Peter Mayle sips a cup of superior coffee and waves to the mayor's sister as she passes on her way to the boulangerie. Sockless in his Gucci loafers, and with a languid summer tan that still glows like cinnamon, the famous author looks like something that's just been pulled from the oven himself; something cherished and bronzed, perhaps, like a nice cake or a walnut loaf. Certainly, after making millions from his best-selling books on life in Provence, Mayle has the toasty, satisfied air that comes with being a very rich man who owns a 15-acre spread in the hills behind us, complete with a fine old bastide shaded by a plane tree that was planted before the Revolution. This is Mayle's haven, a place where he drinks a jigger of olive oil every morning, walks his dogs, bathes daily with Savon de Marseille, swims in his own pool and burns lavender branches on the hearth in winter to fill the house with scent. You know what I'm talking about? That kind of contentment. "Oh, here we go. Journalists are always jealous of me," says Mayle. "I get a bad press because journalists firstly dislike anyone who worked in advertising because it pays so well and they can't bear it, isn't that right?" "Secondly, they are bitter because I made a lot of money out of books. Then they dislike that I live here and they always call me smug, because they mistake my contentment for smugness. I don't know why, really. I'm not a smug person at all," he says lightly, although later he will tell me how much the carping has upset him and his wife over the years. "Please don't hate me because I'm happy," he adds, and it seems like a reasonable enough request. I promise I will try my best. In the tiny, winding streets that spill out around Mayle, the aroma of hot, sugared pastry, wood smoke and frying garlic floats on the crisp air as the village gears up for another typically profitable Provençal day. The tourists are here already, their coaches parked up near the 15th-century château, their purses at the ready for the purchase of oils, bowls, dried herbs, lavender bags, scented candles, sausages and galvanised jugs. The fact that they are here at all owes almost everything to 67-year-old Mayle, whose whimsical books on his beloved Provence have been translated into 22 languages and sold millions of copies around the world. Of course, not everyone thanks him for this, some even believing that Mayle has been a disaster for the area, pushing up property prices and the cost of restaurant meals, while poking fun at the locals for the amusement of his readers. A businesswoman who has been selling villas in Provence to overseas buyers for over 20 years was blunt. "He has brought in crowds of the wrong people," she seethed, although Mayle is contemptuous of this view. "I've heard all that before and I hate that kind of snobbery," he says. "We are all tourists in one way or another. Tourists have been coming to Provence for thousands of years and no wonder, because it is a lovely place. No one, not even me, has just discovered it or can lay claim to it. Tourists always get a bad reputation, but what would happen if they didn't come and boost the local economy in the way that they do? The whole of Provence could be concreted over and industrialised, and who would want that? Perhaps people should start seeing that tourists are a force for good, instead of vilifying them." Suddenly, there are screams from the souvenir shop down the street, and a group of Japanese visitors look on with silent but profound interest when a vipérine snake is found lurking between the baskets of lace, and the café owner is summoned to kill it with a knife. "Heh heh, they'll be thinking, mmm, sushi," says Mayle, taking a sip of coffee and perhaps wondering how he can work the chucklesome incident into one of his books. His books! Just when you thought it would be impossible for workhorse Mayle to churn out yet another book on the joys of southern France, up pops the 286-page Provence A-Z, complete with entries on Accents, Aioli, Amandes, Anchoiade, Antiquités and Zingue-Zingue-Zoun, which I now understand is an onomatopoeic Provençal word used to describe the sound of the violin. Mon Dieu, you think, how does the old boy get away with it? A Year in Provence in 1989, and went on to include Toujours Provence, Encore Provence plus seven more titles, some of them novels, but most based on his own experiences living in this lavender-rich corner of France that he has made his own. Mayle's most recent novel, A Good Year, has just been made into a film directed by Ridley Scott and starring Russell Crowe, which will be released here next month. The author is feverishly hoping that it will fare better than the BBC's frightful 1993 adaptation of A Year in Provence, which starred the late John Thaw. Although a fine actor, the lugubrious Thaw – an alcoholic depressive in real life – was hopelessly miscast as the bibulous, cheery Mayle and the series was a huge flop. "Don't talk to me about John Thaw, that man nearly ruined my life," cries Mayle. "Oh God, what a disaster. He was supposed to be enjoying himself in beautiful, sunny Provence, yet he would sit there on set surrounded by bottles of rosé and look like he wanted to kill himself. He couldn't do light-hearted. He couldn't be fun in that way. I don't blame him, the poor man. It was all the fault of some idiot at the BBC who thought that as my book was the best-selling one that year and Inspector Morse was the most popular television show, it would make sense to put the two of them together. Well, it bloody well didn't, and I suffer from it to this day. Little old ladies still come up to me and say, 'Why did you put Inspector Morse in Provence? That was silly because he wasn't happy, he looked far too gloomy?' And I just have to grit my teeth and say, 'I know, I know.' "
Still, A Year in Provence remains the most famous of Mayle's works, and tells the story of how he moved to Ménerbes in 1987 with his third wife, Jennie, and the adventures that ensued as he bought and renovated an old house. On the surface, it was a simple and charming book – although much disparaged now, in the way that hugely successful things always are – but it somehow tapped deep into a slumbering, latent, hitherto unknown British desire for sunshine and fine wine, for peeling shutters and croissants, for distressed armoires and saucisson and the good life in the French countryside. In the end, so many people read Mayle's book, then came to see Provence for themselves, that they drove him out of the country and into a four-year hiatus on the east coast of America. It was not that he minded the tourists – he never has done – it was the fans that did for him in the end. Unthinkingly, Mayle had identified his house so clearly in the book that, in high season, admirers would pilgrimage there to swim in his pool and even sit in his living room if he was out. "It became intolerable, it really did. There would be four people at the front door, five people at the back door and a couple more in the vegetable patch. I never really knew what they wanted, but it would happen all day long. We just couldn't stand it any more," he says. Yet on Long Island, Mayle missed the smell of thyme in the morning and returned to his adopted homeland in 2000, buying a discreet bastide that is hidden from view by the hills and whose exact location he will never reveal. "I had to come back. I realised that on a house-hunting trip here, when I saw a French man power-washing his underpants with a hose in his garden. That really brought home the difference, cultural and otherwise, between the old world and the new," he says. Mayle candidly admits that his house is huge and that his great extravagance is space. "It is a great, big house but we only have three bedrooms, and a guest apartment with two bedrooms, a kitchen and a terrace. In the main building, Jennie and I each have a dressing room, we each have a bathroom and we each have an office," he says. His favourite thing to do at home is swing in his hammock after lunch and his favourite gastronomic treat is a truffle set on a piece of foie gras, wrapped in tinfoil, baked in the oven and eaten like an apple. If he had £50,000 to spare – and actually, he does – he would spend it on trees, while his pride and joy remains his rose garden, complete with a wrought-iron gloriette covered in climbing roses that looks, in bloom "like a really rather vulgar painting, absolutely stunning". Grrrrr, gnash gnash. Go on. Tell me about the film. "Well, Ridley's an old friend of mine. We worked together in advertising years ago. He's a neighbour, with a place just down the road, and he loves it here. We cooked up this idea together that I would write a book about a winemaker who came to Provence and Ridley would make the film so that he could spend more time here and it all worked out rather splendi… uuuuurrrk, get off me! What do you think you are doing, you madwoman?" squeals Mayle, as my hands slip around his neck in a Tasmanian death grip and I make his little white head go bang-bang-smash off the metal café table. Well, of course I don't really. I barely scratched him, your honour. And over lunch in a charming restaurant of his choosing, I note again that Mayle seems much gentler and nicer than his detractors would have you believe, and is welcomed with genuine warmth by all the locals we meet. Except when he has to hold the menu one inch from his nose to read – which he does avidly, with a trencherman's relish – he seems much younger than his years, although he has that calcified tendency to insist that he is right about everything and remains intolerant of much; such as English people who shout when trying to make themselves understood in France and the worthlessness of e-mail, which he does not have and anyway, he knows that all people receive every day are hundreds of useless jokes. And Viagra adverts, I tell him. "What? You are joking," he says, looking startled. Over tatin de foie gras et figues, he talks about his perfectly arranged life on the sunlit uplands of Provence, but reveals the outlook was not always so rosy. "I don't have any misty-eyed feelings about my prowess as a husband or father. I was pretty terrible at both," he reveals. Born in Brighton, Mayle says he was a young man in a hurry to get on in the advertising industry, and who also married too young. "So many of us did, it was what happened in those days," he says. He was barely around to see his five children growing up, including his elder daughter, the New York-based dress designer Jane Mayle, who is hotly tipped to be the new head of the Chloé label in Paris. "Her clothes are lovely but quite expensive," he says, in that bemused, male way. Mayle left advertising too early, he now believes, then spent 15 years scraping a living collating brochures and "writing by the yard". Money was a worry. "My life has not been glittering and easy, despite what you might think. I had plenty of low points, but one of the great mistakes in life is just to sit there feeling sorry for yourself. Nothing is going to become of that. Put yourself at the risk of a piece of good luck instead." Of course, good fortune did shine on Peter Mayle, a man who knows how to enjoy himself and who has, quite literally, made an art form of it. "Yes, I love my life, even if I feel a delightful waning of my powers. I don't want to do 50 push ups before breakfast. Instead, I want to enjoy the things that one can enjoy at my age: friendship, food and drink, the beauties of nature. The only thing I want from tomorrow is that it should be as good as today." He's already writing his next book. He's happy. Don't hate him. 'Provence A-Z' by Peter Mayle is published by Profile Books. Portrait photography of Peter Mayle by Andrew Crowley.